From the moment my daughter met the outside world, I was a changed human being. That’s what happens when you give birth for the first time.. you change in a way that is total, immediate, and undeniably profound. There are absolutely no words to describe the feeling of looking at, holding, your very first child for the very first time. It is all of life in a single moment. It is love, wrapped up in fear, wrapped up in love. It is transcendent. Those first few days were so intense. The breastfeeding, the love and the worry. The physical discomfort. It’s a mixture of the physical alterations of your own body and the mental saturation of processing so many new emotions, all while having this entirely new human being to care for. Your body is no longer your own. You’ve voluntarily loaned it out for an indefinite period of time. Your mind is no longer your own, because this tiny person has taken possession of it, along with your heart. The love. It is so new and so powerful and so all-consuming that it ignites the flame of fear. That fear begins to burn and all of a sudden you have a forest fire of Love and Fear raging inside– the Love is the oxygen and Fear the flame–and in an instant it can burn your composure into ash. Love plus fear is an atom bomb. Love minus fear is a narcotic. The fear– what is it? 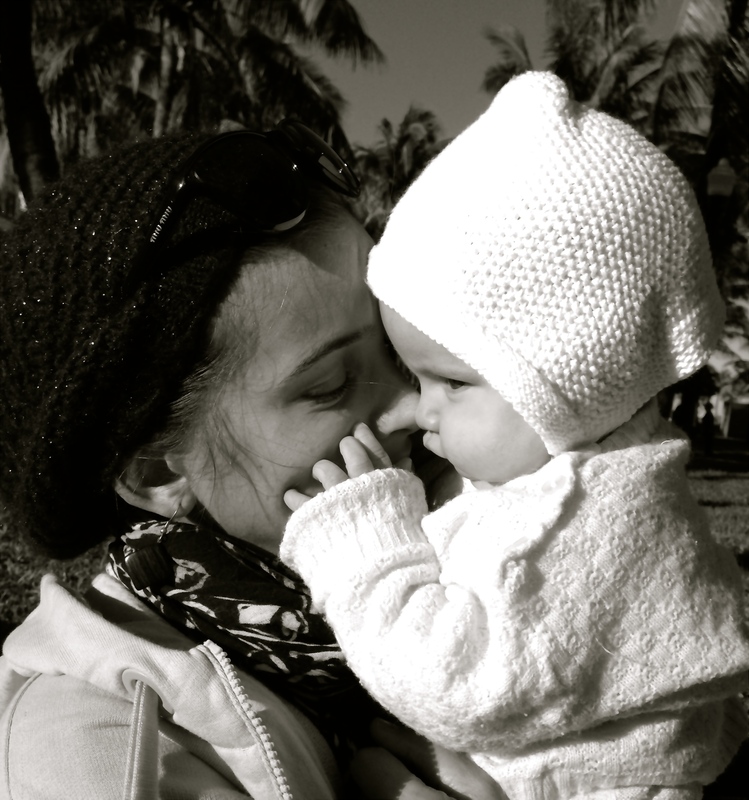 My fear had very little to do with worries about mothering or how to do certain things. My fear was all about the love. I was terrified by how intensely and fiercely and deeply I loved her, so immediately. I knew that I would die for her, and protect her with my very life. But more fearful– I felt that if anything bad happened to her that I would die of a broken heart. Life would not be possible without her, now that she was here. I felt that so strongly, with such conviction, that it overwhelmed me. I had a nervous breakdown on the third day after she was born. I will never be the same. My life is forever altered. I can never stop loving this little person, and this love is so strong I’m afraid it could kill me. I’m afraid of all the pain and suffering in the world, all the anger and strife and danger and cruelty. I’m terrified that it will reach my daughter. I’m paralyzed by the thought of her choking at age 1, of drowning at age 2, of being hit by a car, kidnapped, abused, sick, cancer, heartbreak, depression, anger, hating me, how can I control any of it? How can we control life so that our children will forever be safe and happy and perfectly unmarred? It is not possible. I broke down in a flood of uncontrollable tears, gasping for breath. My husband was just downstairs, outside on the driveway. I could see him from the bedroom window. I could not call out to him because I was so deep in my own mind. I was alone. And then, finally, I calmed down. Began to breath again. My daughter had not cried out once during my hysteria. She was as calm as a windless sky. I looked down into her eyes and knew that we would make it through… we would make it through life. I never again allowed the fear to take me over in such a way. Of course the fear is still there–sometimes hiding deep inside, sometimes just below the surface. It is not as prominent now as it was during those first few months, but it will always be present. I think that as parents we unconsciously agree to live with this constant worry. It is the price we must pay in exchange for the depths of love and joy that a child brings to our lives. And it is so worth it. I have read this twice!! I read it today and I read it on Sunday. It gave me chills both times. You are amazing and you speak of so much truth! It is such a scary common feeling and you just worded it so beautifully. A forest fire of love and fear! YESSS!! Ah, I love it. And I love you.. But Elena’s squishy cheeks…. Oh my gosh. I can’t even. Thank you KT!!! Thank you for that.. it is not easy to get these motherly emotions out into words. Sometimes I feel like I’m attempting to translate Latin to Swahili or something. You know what I mean I’m sure! LOVE love you. You express the love and fear a mother has for a child so well. Touched me to the bones and made me cry. Amaya is 11 and I still have these overwhelming moments of anxiety. I don’t think that will ever change. There will always be worries but the love and joy our children bring makes it so worth it all! You are such an amazing mother Tara! Love you much!!! Thank you sweet Carmella. We are so very lucky to have these precious babies (both big and small!) in our lives. Love you!!! !